Harriet Seebald MacDonald has lived most of a century bridging the gap between the worlds of the hearing and the deaf. At the celebration of her 100th birthday Sunday, members of Pennsylvania’s deaf community gathered with MacDonald’s friends and family to recognize her contributions to making the Lehigh Valley a more inclusive place for the hearing impaired. MacDonald, who lost her hearing before age 2 but remained able to speak, gave aid to the hearing impaired who didn’t share her multifaceted communication skills and illuminated the lives of the deaf for those who could hear. “She exposed the hearing world to the fact that it was OK to be deaf,” said retired pastor Bruce D. MacLaughlin, who led the Lutheran Church of the Deaf in the Lehigh Valley, where MacDonald was a member for many years. 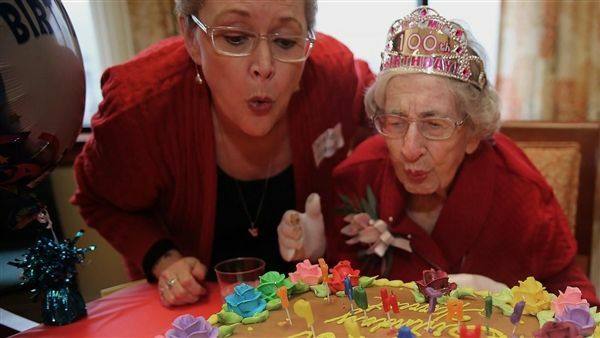 Bejeweled in a plastic tiara that said “It’s my 100th birthday,” MacDonald, offered a few words of advice after blowing out candles on her chocolate frosted cake. “Keep your life interesting,” MacDonald told those gathered at Luther Crest Personal Care Center where she lives in South Whitehall Township. “Walking makes it better,” she added, attributing her longevity to her favored mode of transportation. MacDonald never learned to drive. Interesting is an understated way to describe MacDonald’s life, said her longtime friend and American Sign Language interpreter Carole Silvoy. Born in Allentown to parents Harry and Edith Williams Seebald, MacDonald lost her hearing after contracting scarlet fever as a toddler. After struggling in school, MacDonald’s mother, a fierce advocate, enrolled her at Pennsylvania School for the Deaf in Philadelphia when she was about eight, Silvoy said. Each Sunday evening MacDonald’s mother took her to school in Philadelphia’s Mount Airy section and returned to take her home on Friday nights so that MacDonald could spend the weekend in Allentown with her brothers. Peter Bailey, head of school at Pennsylvania School for the Deaf, recognized MacDonald on Sunday as the institution’s oldest living alumnus. The school will celebrate its bicentennial in April. Silvoy said that MacDonald’s early experience with language at school set her on a path she would follow for the rest of her life. As a result of her immersion in the deaf community at school, MacDonald learned to sign. But sign language was officially frowned upon, Silvoy said, because experts believed it would keep the deaf from communicating with those who could hear, so MacDonald also learned to read lips to understand her lessons. After graduating with honors from Philadelphia School for the Deaf in 1939, MacDonald went on to attend Moravian Women’s Seminary, where she graduated in 1943. MacDonald married Kenneth J. MacDonald Sr., who was also partially deaf, in 1950 and the couple had a son, Kenneth Jr. She had jobs in the Allentown controller’s office and at Western Electric, but it was MacDonald’s volunteer work, including many hundreds of hours at Good Shepherd Rehabilitation Hospital, that defined her, Silvoy said. The hospital honored her with the Conrad Raker Award, named for its founder, in 2000. Among her achievements for the deaf community, was the establishment of a teletypewriter relay service — a system that allows the deaf to communicate by telephone by transmitting text — in the Lehigh Valley years before it was required by the Americans with Disabilities Act, Silvoy said. MacDonald refused to be limited by her hearing impairment, traveling to nearly every continent, often by herself, Silvoy said. MacLaughlin said MacDonald’s ability to network made her an integral part of the Lutheran Church of the Deaf congregation. Her ability to talk as well as use sign language made her confident as an advocate for deaf people who weren’t as comfortable interacting outside relatively small circle of people who sign, MacLaughlin said. “Harriet felt really good about who she was,” he said. In this 1999 Morning Call photo, Harriet MacDonald relates stories to members of a deaf senior citizens social group at the Lehigh County Senior Citizens Center. The group met twice a week to share stories and play cards. World War I ends with an armistice signed by the Allies and Germany on the 11th hour of the eleventh day of the eleventh month. Everyone is singing the hot new song "K-K-K-Katy"
Mississippi becomes the first state to ratify the 18th amendment, which prohibited alcohol. The Sedition Act of 1918 makes it illegal to criticize the government. Daylight savings time is introduced in the U.S.
Russia becomes a republic of Soviets. Women in Great Britain get right to vote. The German fighter pilot known as "The Red Baron" is shot down and killed. Spanish flu kills 675,000 Americans and as many as 50 million people worldwide. These people also are born: preacher Billy Graham, South African revolutionary and President Nelson Mandela, Egyptian president Anwar Sadat, baseball player Ted Williams, sportscaster Howard Cosell, actor William Holden, actress Rita Hayworth, and composer Leonard Bernstein. Two Penn State quarterback legends get acquainted in New York. This article originally appeared in The Morning Call. ﻿To read the full article, click here.